Keep your pet warm and cozy through the winter! K&H Self-Warming Crate Pads are the perfect addition to make your dog's crate a cozy place to rest during the colder months, but they work great outside the crate, too. Utilizing a metalized insulation, these self-warming crate pads capture your pet's own body heat and radiate it back at them, eliminating the need to use an electric pad. 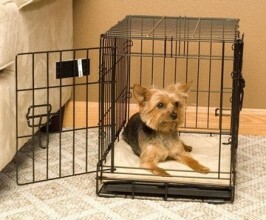 Available in six sizes to fit your crate and/or dog. The top surface of the pad is made of a soft microfleece for your pup's comfort while the bottom has a "stay pet" non-slip fabric to keep the pad from slipping and bunching up on one side of the crate or your hard surface floor. The soft fill is made from recycled plastic bottles. On top of it all, you can simply toss the whole pad in the washing machine to clean! All four corners of the pads are slit to allow the crate pads to fit many different edge shapes. Soft and pliable, these pads can be made to fit in a variety of sized crates. Choose your color and size. • Self-warming materials radiate your pet's own heat back - no electricity needed! 22" x 14" x 0.5"
25" x 20" x 0.5"
31" x 21" x 0.5"
37" x 25" x 0.5"
48" x 32" x 0.5"
54" x 37" x 0.5"
Our K&H Self-Warming Crate Pads are in stock and waiting for you to order. Most orders will ship same or next day, so your pooch could be enjoying a comfortable new pad sooner than you think. Free Shipping on orders over $50. Combine with a Midwest crate!